Friday was an AMAZING day. I observed a course on French Regional Cooking where a lamb dish was prepared. I participated in an evening class on French Regional Cooking where we prepared a braised veal dish with stuffed cabbage. And in between the two classes, I went to visit and purchase French Macaroons at the Gucci of Macaroon Patisseries, Ladurée. First the Lamb dish. I grew up not eating much lamb. Mostly because my father didn’t like it so my mother never made it. I had tried it from time to time in restaurants by taking a bite of a friend’s dish. Sometimes I enjoyed it, sometimes – not so much. It wasn’t till about 5 years ago when I was in Cape May, NJ, that I discovered lamb that I found DELISH! My friends Mark and Elliot took me to a restaurant there where they had a stuffed lamb chop that was heavenly. So with that said, I have never made lamb and wanted to learn about its preparation. 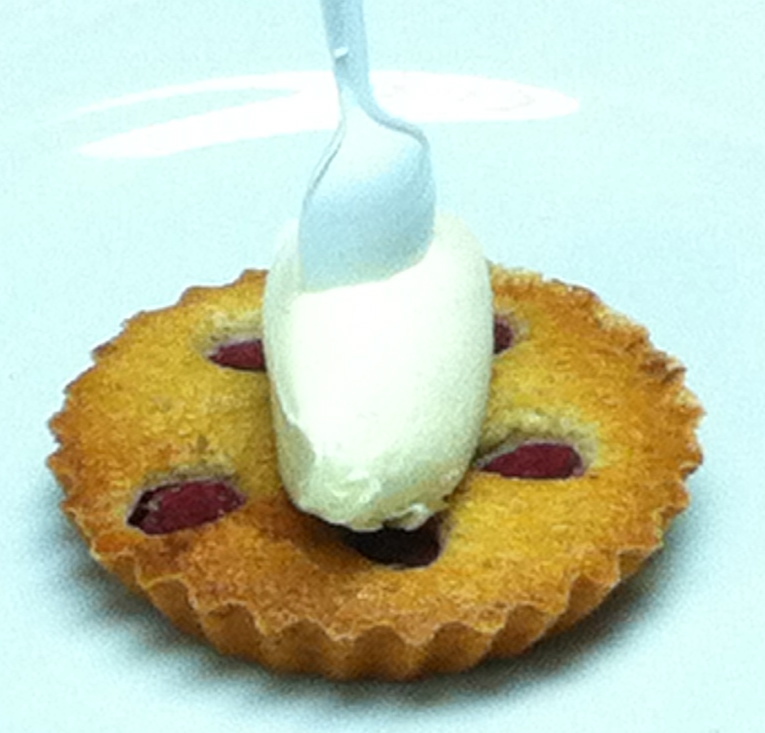 This dish is from the Ile-de-France region of France, which is the outskirts of Paris. The dish was prepared in class using the chops from the shoulder region of the lamb. These 5 ribs are not the most popular set of the 13 that a lamb has to offer. The other 8 are the chops that most people look to purchase. Because the shoulder region chops are not as tender, they would be slow cooked in a deliciously flavored stock. The chops are cut double thick, one of the bones is removed, then the chops are browned and layered in a dutch oven with sliced potatoes, caramelized onions and a lamb stock. 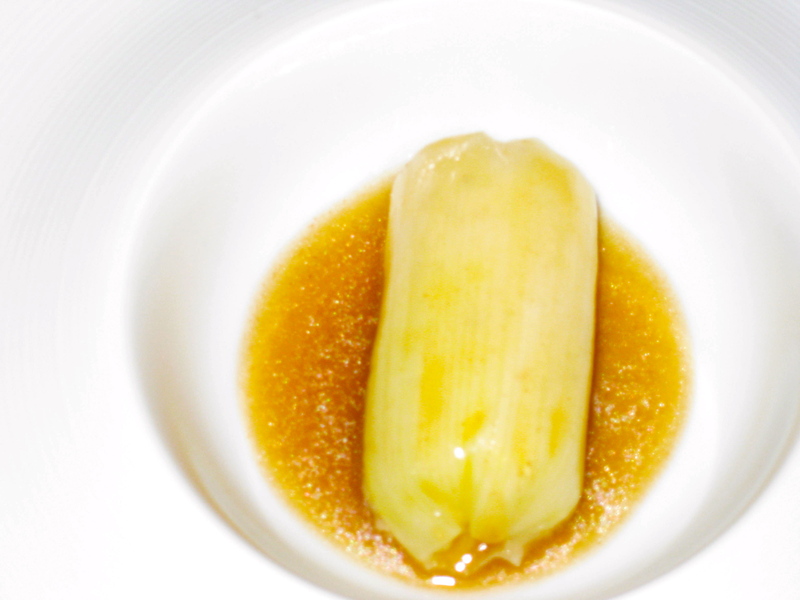 This is served with a mashed potato and leek “cannelloni” which is basically the mashed potato and leek puree piped into the blanched outer layer of a leek and rolled to look like cannelloni. The amazing aroma that wafts our way as the chef was preparing this dish thoroughly distracted me from making my notes. Even the students who attend these kind of classes regularly were saying “today is going to be a great tasting!” My stomach started to growl as I turned my attention back to hurriedly making my notes so I could make this at home. When we finally go to taste this dish, I was enraptured! I vowed right then and there to make more lamb and especially this dish! The dish is layered with sliced potatoes on the bottom, then a layer of caramelized onion, the browned chops, caramelized onions again, then topped with more sliced potatoes arranged beautifully on top. A piece of parchment paper to cover then the lamb stock gently ladled over just till the top layer of potatoes is covered. Into the oven to cook slowly – ideally all day on a low oven – but for class at a higher temperature for 45 minutes. Words can’t do this dish justice! 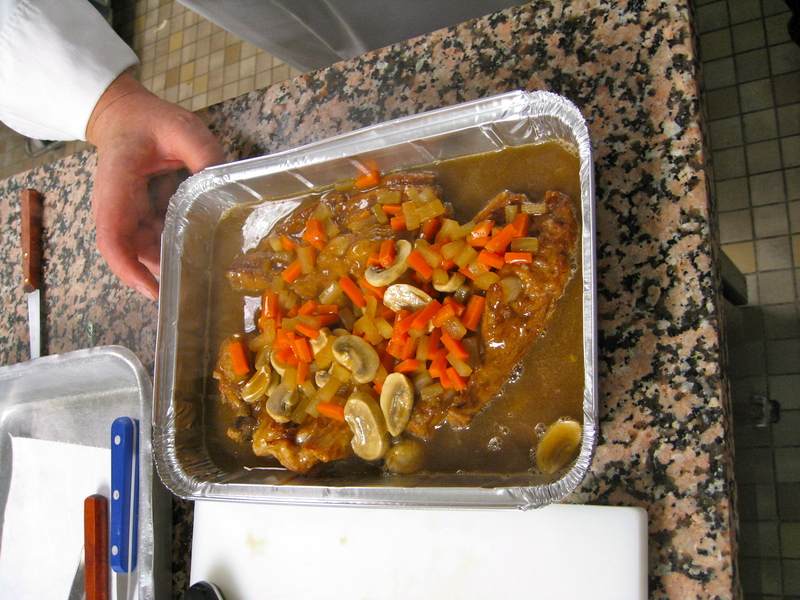 My Braised Veal creation - The Chef said "How beautiful!" 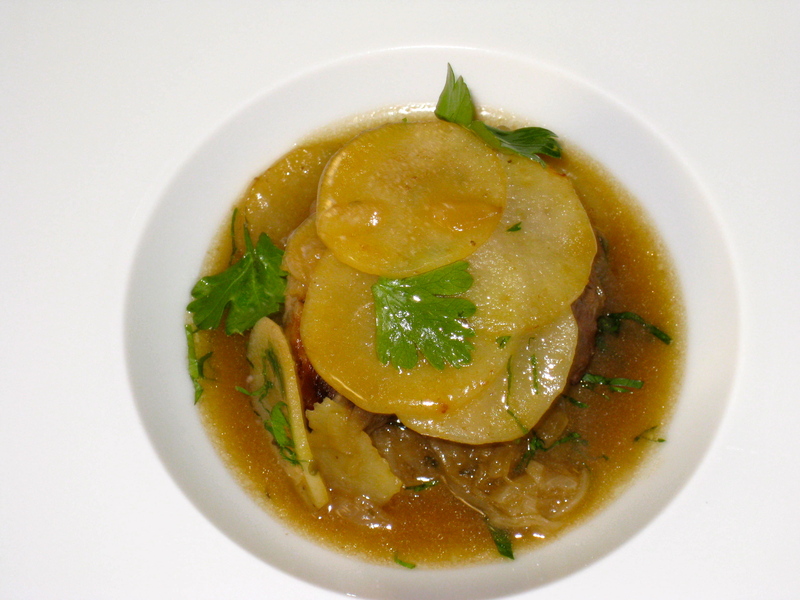 The veal is also a slow braise using cuts that need to be slow cooked. We coat our veal with salt, pepper, and dust it in flour. Browned on both sides to a lovely hazelnut color, we remove it from the pan to create the braising liquid. We add chopped onion, carrots and mushrooms to the sauté pan that we just browned the meat in and let them caramelize slightly before we deglaze the pan with Pinot Noir (yum!). After this reduces a bit, we add veal stock and return the veal to the pan and cover for a nice braise for 50 min. The flour from the chops thickens the braise slightly to creates a fantastic velvety sauce. We strain our sauce and add fresh veggies – carrot, daikon radish and mushrooms and simmer them to the texture of our choice. Check our sauce for seasoning and pour it over the veal in our aluminum pan we’re using to transport our treasure home. The Chef insists that we wait until tomorrow night to reheat and eat it. He says the flavor will be MUCH better the next day. And… He’s right! I ate it the next night with a friend to rave reviews. I will definitely be making this when I get back home! French Macaroons are a bit of heaven here on earth! In the US, when you say “macaroon” people immediately think of the coconut macaroon that has been a part of the American diet for years. French macaroons are entirely different. Pillowy small clouds of brightly colored meringue that has almond powder mixed into it and baked to the perfect texture sandwich a delicious filling. They come in all different colors and flavors and when I see a variety box of them, it reminds me of a box of jewels. 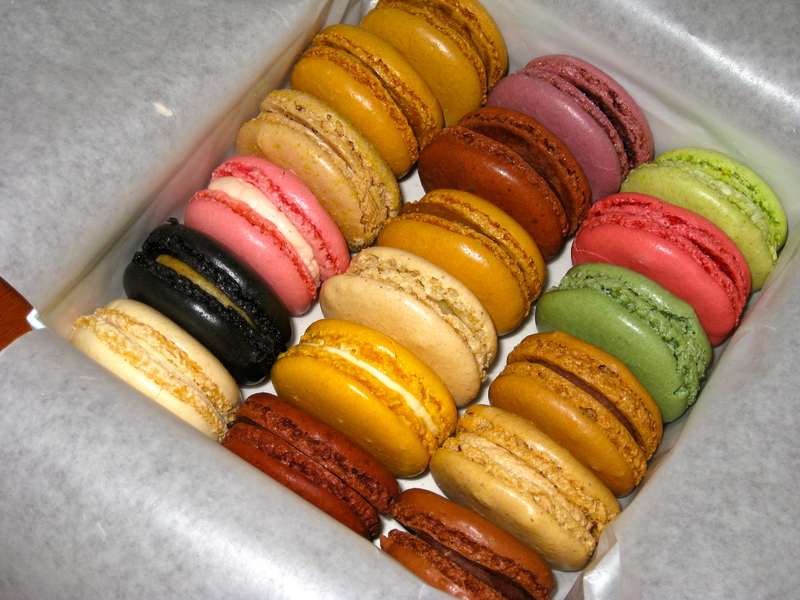 French macaroons are becoming very popular in the United States. I actually heard someone say that they are becoming the new cupcake – and I would agree! In Paris when you mention the work “macaron” (French spelling), the immediate response is Ladurée. Although you can find macaron in almost every patisserie in Paris, Parisians assert that Ladurée is the only place you should buy them. At more than twice the price, I had to see if they were worth it. I went to Ladurée on rue Royale as it is near the Metro stop Concorde where I change trains almost everyday. As I walk down rue Royale, I see I’m in a very swanky part of town. Gucci, L’Oreal Paris, and other high-end boutiques line the street. As I cross the street to get to Ladurée, I see there is a line outside the door. It’s cold but I figure, what the heck, I’m here and I’m dying to try these macaron. Once I get into the shop, it is beautiful. There are many other types of pastry here, but I’m only after macaron today. The woman who waits on me is very helpful. There are so many different flavors and choices it’s difficult to make decisions. I decide to let her create a variety box for me. She packages them in a beautiful box that she ties a ribbon on and presents to me with pride. Once home, I let them come to room temperature before I dive in. They are definitely worth the price. The texture is crispy on the outside, tender on the inside and the fillings are perfectly flavored. The most unique is the bergamot, which flavors earl grey tea if you’re familiar with that. I also love the rose flavor. Please check out the Ladurée website to see all their delicious flavors. Those of you that live in NYC will be happy to know that they have opened one there! Ah bon mes amis. My experiences in Paris keep getting more and more enjoyable. All these new techniques and flavors excite my pallet and inspire my creative mind. I do have a kitchen in the apartment I’m staying in but it is really not equipped to try many of these recipes. I look forward to getting back to my own well-equipped and stocked kitchen to create some of these delicious dishes for you – on camera. Today I set out to do one of my favorite things – shop for cooking gadgets, equipment, supplies – stuff. Although it was VERY cold here in Paris today, I was not going to let that deter me. Admittedly, this shopping spree was tame in comparison to most in terms of the amount of “stuff” that I bought. But, I’m here for a month and have plenty of time to fill another suitcase or two with cooking supplies that I can’t live without! I have watched the Chefs at Le Cordon Bleu use many items in the kitchens. Most of the equipment I’m very familiar with. Some of the items they are using are new to me and I just had to have them!! The school, being very helpful indeed, has a printed list of all the places in Paris they recommend such as libraries, dining, ice cream shops, patisseries, and… cooking utensils. Thankfully, many of the places they recommend for cooking equipment are all near each other in the 1st arrondissement* near Les Halles – the center of Paris.